SEOUL, South Korea — When President Moon Jae-in took power in South Korea last May, he vowed to make his disaster-prone country a safer place to live. But public skepticism over his ability to deliver has deepened with a string of tragedies in recent weeks, including a hospital fire that killed dozens of people on Friday. The fire that engulfed Sejong Hospital in the southern city of Miryang was the deadliest fire in South Korea in a decade. It also came barely a month after another fire killed 29 people in December. Both accidents revealed deep flaws in the country’s safety standards, like the lack of fire sprinklers in the hospital, problems that are likely to further erode public confidence in Mr. Moon’s ability to deliver his campaign promises just as the country prepares to host the Winter Olympics. In Friday’s fire, the government even had trouble delivering an authoritative death toll, a common problem in South Korean disasters. The local police, fire department and health authorities announced 41 had died, but later revised that number to 37, saying some bodies were counted twice. But they said that the death toll could rise again because more than 100 people were injured, 10 of them seriously. On Friday, officials were still investigating the cause of the fire, which they said started on the hospital’s first floor, where its intensive care unit was filled with older patients, many of them unable to move on their own when the fire broke out. Like other rural towns in South Korea, Miryang has seen its population rapidly age in recent decades as its young have abandoned farming and migrated to cities. Miryang residents who have used the hospital reported that its intensive care unit was typically overcrowded with aging patients. South Korea’s rich prefer big university hospitals in major cities that attract patients with modern equipment, while smaller provincial clinics are often poorly staffed and equipped, and often squeeze as many beds in as possible to remain financially viable. The Miryang hospital even lacked fire sprinklers, said Choi Man-woo, chief of the local fire department. He said many of the victims were believed to have died from inhaling smoke. The dead included a doctor and two nurses, Mr. Choi said. While tackling the blaze at the hospital’s five-story main building, where all the deaths occurred, firefighters also had to evacuate patients from an annex that operated as a nursing home, carrying some of the patients on their backs because few of them were able to walk. “That I covered myself with a wet towel and thick blankets was all I remember,” Lee Ok-soon, 78, a Sejong Hospital patient, told the national news agency Yonhap after she regained consciousness in another hospital. Ha Yong-gyu, 89, was hospitalized on the fifth floor with a cold when the fire erupted. “I was coming out of the restroom when I saw the thick smoke in the hallway and heard people shouting for help,” Mr. Ha told Yonhap. With its death toll, the Miryang accident was the most deadly fire since an inferno engulfing a cold storage warehouse killed 40 people in 2008, including 13 ethnic Korean workers from China who migrated to their ancient homeland for better pay. In 2003, 192 people died in a subway arson. South Koreans’ concern over their country’s safety standards has become a major political issue since an overloaded, poorly inspected ferry capsized in 2014, killing 304 passengers, most of them teenagers on a school trip. Mr. Moon, then an opposition presidential candidate, rode a wave of public anger over the alleged corruption and shortcomings of his predecessor, Park Geun-hye, whose government was widely accused of not only failing to respond adequately to the sinking of the ferry Sewol but also of whitewashing the investigation. In the initial hours, the central government and the local authorities issued confusing data on the death toll, including announcing that all on board had been rescued. Mr. Moon’s credibility on that front was dented when 29 people were killed and 40 injured in a fire that gutted a sports center in the town of Jecheon, about 75 miles southeast of Seoul, in December. Most of the victims in that fire were trapped in a public sauna on the second floor of the building. Fire engines had trouble reaching the blaze because so many illegally parked cars blocked the narrow alleyways. “I am too ashamed to say again that this kind of thing will never happen again,” Prime Minister Lee Nak-yon, the No. 2 official in Mr. Moon’s government, said on Friday while visiting Miryang, about 170 miles southeast of Seoul. The latest fire came as Mr. Moon’s popularity ratings have been slipping over his government’s decision to form a joint women’s ice hockey team with North Korea for next month’s Winter Olympics. In a deal that Mr. Moon’s government has billed as a major step toward improving ties on the divided Korean Peninsula, the two Koreas also agreed to march together, carrying a “unified Korea” flag, during the opening ceremony in the South Korean town of Pyeongchang on Feb. 9. Many South Koreans agreed with Mr. Moon that North Korea’s Olympic participation would help calm jitters after a year of acute tensions spurred by the North’s nuclear and missile tests and President Trump’s threat to rain down “fire and fury” on the country. But Mr. Moon’s decision to form a joint hockey team with the North after it threatened its neighbors with nuclear weapons has proved vastly unpopular, particularly among young voters, Mr. Moon’s traditional supporters, according to recent surveys. His approval ratings slipped to 64 percent this week, three percentage points down from last week, according to a survey published by Gallup Korea on Friday. It was the lowest Gallup Korea rating since Mr. Moon took office. The survey was taken before Friday’s hospital fire. The pushback against Mr. Moon’s North Korea initiative has caught his administration off guard. Progressive politicians affiliated with Mr. 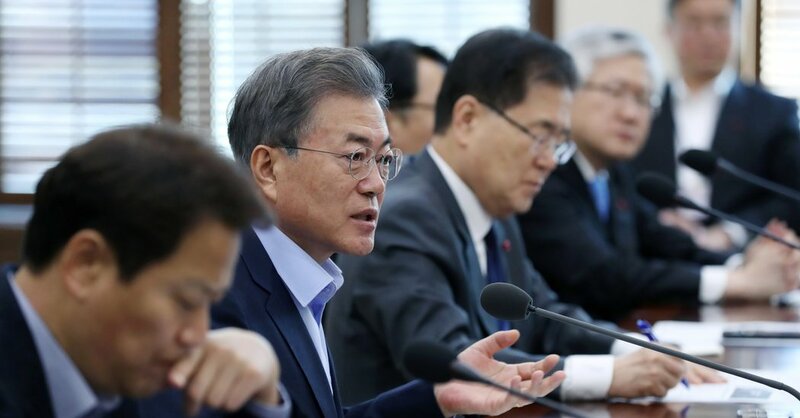 Moon have hoped that the Olympics will help create a political thaw, adding momentum to Mr. Moon’s policy of promoting dialogue with North Korea, as political parties gear up for mayoral and governors’ elections in June. Mr. Moon’s Democratic Party remains the most popular political party, although its approval ratings, too, have declined in recent weeks. Mr. Moon convened an emergency staff meeting on Friday in response to the fire and “expressed deep regrets” over the high death toll, his office said. He also ordered a thorough investigation and called for measures to prevent similar fires. The accident also drew attention because the hospital had a nursing home as an annex. In South Korea, which has one of the world’s fastest-aging populations, the lack of safety measures at its growing number of nursing homes has become a major issue in recent years. The concern was crystallized by the deaths in 2014 of 20 nursing home patients who had dementia or stroke complications. Many died of smoke inhalation because they could not move on their own when the fire erupted.